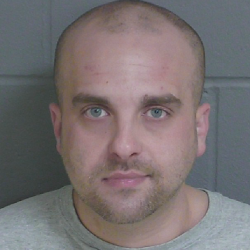 Ryan K. Calista, 30, faces similar charges in Maine and New Hamshire, police said. A New Hampshire man was charged Wednesday by Kennebunk police with impersonating a public servant at a local playground where he reportedly told skeptical onlookers that he was searching for a missing 13-year-old boy. Ryan K. Calista, 30, of Dover, N.H., was wearing a police hat and vest and sported a flashing blue light on his truck when he drove at a high rate of speed into the parking lot at the Recreation Center on Park Street about 2:30 p.m., Kennebunk police said. Several adults present were suspicious of Calista and took photos of him and his vehicle before he left the area. Later, at about 6:30 p.m., Kennebunk investigators learned that police in Dover responded to a similar complaint that evening and had arrested Calista for impersonating a police officer, and on outstanding arrest warrants. A Kennebunk police officer drove to Dover and issued a summons to Calista for the Maine charge of impersonating a public servant. He is due in court in Maine Feb. 20. Kennebunk police said that the department’s plain-clothes officers will still display a badge and will readily show credentials if there is any doubt as to their identity.